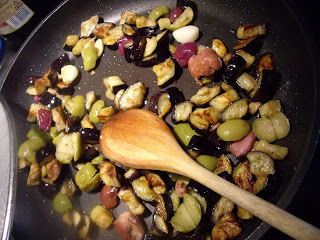 This will be the last recipe I blog from Lucca until the end of summer! 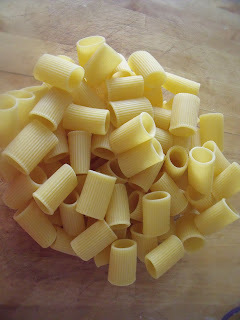 I will be going home for the summer, so I may blog some recipes from my mom's kitchen! 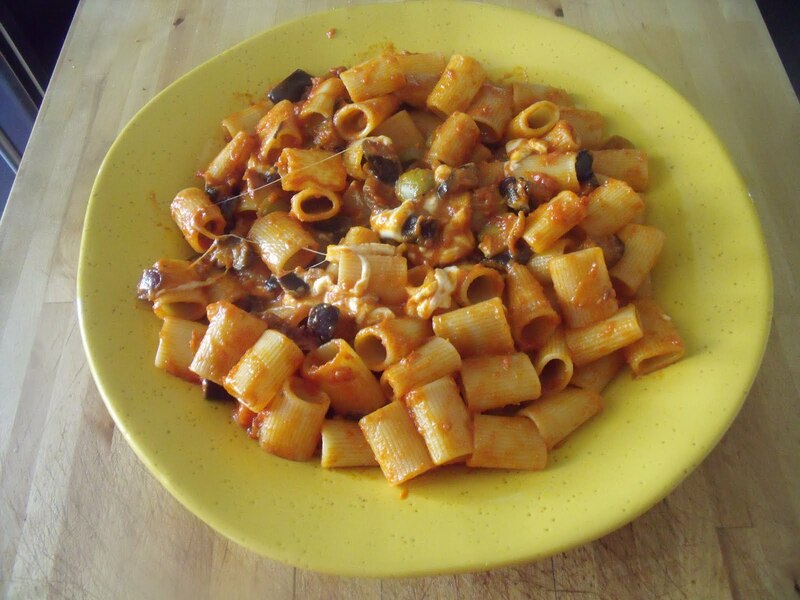 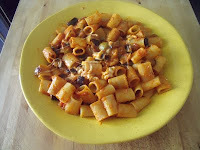 In the meantime, this is my variation of a famous recipe for pasta with a delicious tomato and eggplant sauce. 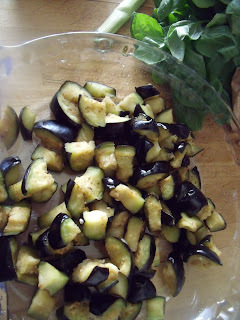 I generally don't salt and drain the eggplant, but I do for this recipe otherwise the eggplant comes too soft. Chop the egg plant in to cubes (1 - 2 inch cubes). Place in a colander, on plate, and sprinkle the eggplant generously with salt. 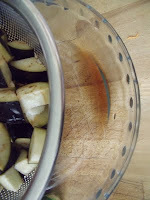 Let them sit for about 15 to 20 minutes. After about 20 minutes you will see the drained liquid in the plate. Now you can rinse, drain and squeeze the liquid out of the eggplant. 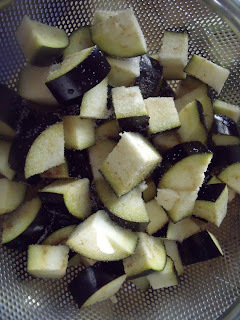 This is what the eggplant should look like after this process. At this point put a large pot of water on to boil, for cooking the pasta. This is how your vegetable mix should look. 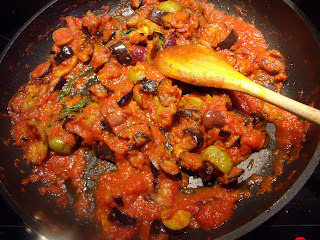 Add the pureed tomatoes and several sprigs of basil. 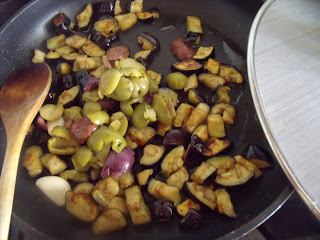 Cover and cook over medium low heat for about 10 to 15 minutes. 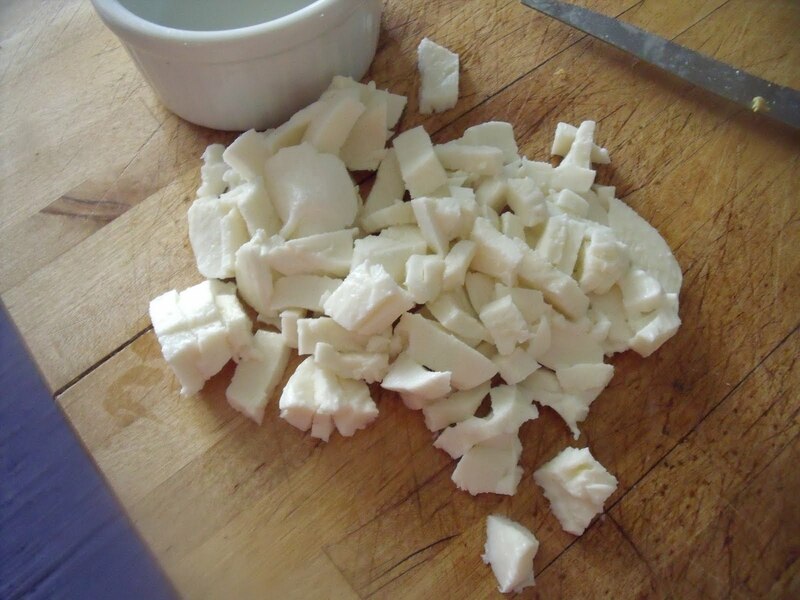 While the sauce is cooking, cut the mozzarella into 1/2" cubes. By now the water is boiling. 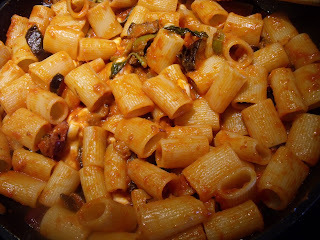 Add salt and cook the pasta "al dente". You sauce should look about like this. Taste it and adjust the seasoning with salt and pepper to taste. 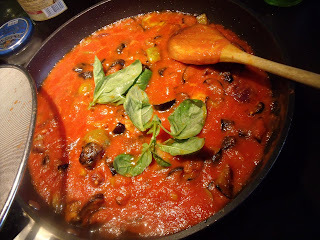 Add the pasta to the sauce in the pan and toss well to coat. 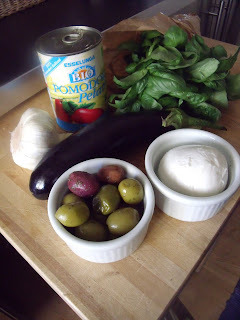 Now add the mozzarella dice, making sure it is evenly distributed over the top of the pasta. Put a lid on the pan and let it rest for about 2 min.